We can start providing treatments for your lawn at any time of year because we know what treatments to use depending on the season and the current weather conditions, so there is no better time to start than now! The lawn care treatment service that we offer works on the basis of applying essential treatments throughout the year – these are detailed below. We recommend a basic four seasonal treatments per year plan plus a yearly spiking/aeration, this will ensure your lawn has the appropriate nutrients it requires throughout the year to control the weeds and moss and encourage healthy grass growth. We also offer additional lawn care services which your lawn may benefit from. These include scarification, aeration, overseeding, top dressing, garden pest control, grass disease control, Lawn Re-Turfing and driveway weed control. This can be the most important time of the year. There is plenty of moisture about and the ground is starting to warm. The grass plant responds by growing vigorously, If the grass is short of food it will not grow healthily. Weak grass allows moss and weeds to develop. We apply a slow release fertiliser to produce a nice steady growth throughout this important time of year. We also apply a broad spectrum liquid herbicide to control common weeds such as dandelions, buttercups, daisies, plantains and start to control clover etc, this may be replaced by a liquid moss control if we feel this would be more suitable. This time of year we apply a non scorch fertiliser to encourage thick healthy growth of grass. There are sufficient nutrients in the fertiliser to nourish the grass for up to 10 – 13 weeks. Our fertilisers are slow release and do not have to be watered in. However, if the lawn is dry, watering in will produce quicker results. A liquid herbicide is also applied to control both common and some of the more difficult weeds such as speedwell, trefoils and clover. Similar to the early summer treatment we apply a non scorch fertiliser to encourage thick healthy growth of grass. There are sufficient nutrients in the fertiliser to nourish the grass for another 10 – 13 weeks. We spot treat any stubborn weeds or weeds that may have appeared since our last visit using a liquid herbicide. The warm weather combined with damp conditions can make this time of year ideal for lawn diseases and moss to attack so Autumn is the key time to start applying moss control. Our Autumn treatment contains a moss control and macro and micro nutrients to help with root development, this treatment also hardens the grass for the colder months to come and also making it more resistance to disease. This treatment also has the added benefit of giving your lawn a rapid green up. Each time we treat your lawn we check for diseases. Our Winter treatment also involves a moss control, this treatment hardens the grass for the colder months to come and again making it more resistance to disease. This treatment also has the added benefit of giving your lawn a rapid green. Heavy moss will be controlled by our moss treatment but as the dead moss plant does not decompose easily the lawn may require scarifying to remove the dead moss and thatch from the lawn to create space to allow grass growth to regenerate. Over-seeding with grass seed may also be required depending on the amount of moss in your lawn. At this visit we also check for any insect damage or traces of lawn / turf disease. Thatch is a build up of dead organic matter laying on the soil surface. Thatch is a natural occurrence as old grass stems die and are replaced by new ones. Bacteria in the soil digest the thatch breaking it down into nutrients for other plants. In severe cases of heavy thatch the bacteria cannot digest all the organic matter and the thatch builds up and forms a fibrous layer on the soil surface. This layer acts like a barrier preventing the free flow of moisture, oxygen and carbon dioxide to and from the grass roots and preventing light reaching the base of the grass shoots. It is vital that thatch is not allowed to build up as it can have a disastrous effect on any lawn weakening the grass, encouraging moss and diseases. Scarifying is the physical process of removing thatch from the soil surface. It used to be carried out by using a wire rake. 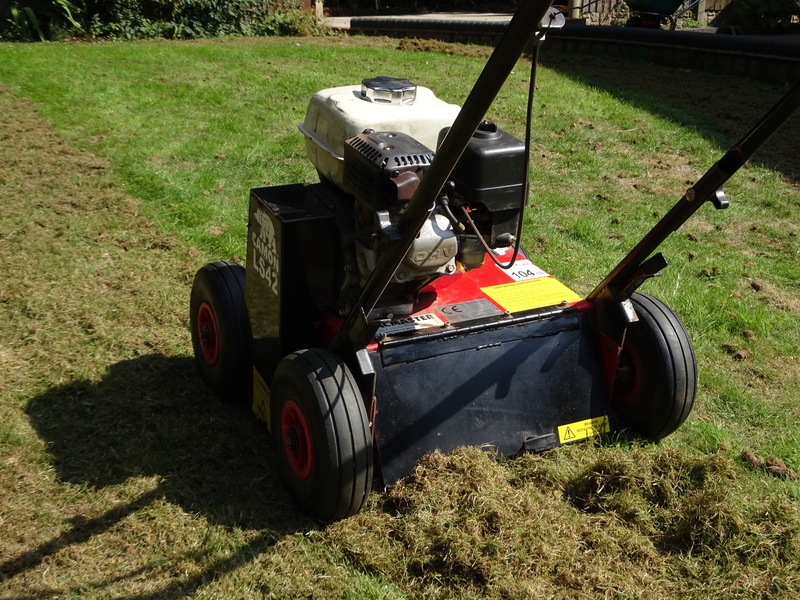 Lawn Therapy have powered machines which scarify far more comprehensively and are far more efficient than raking. Several vertical metal blades revolve at high speed around a shaft and cut into the ground as the machine is pushed along the lawn. The blades can be set at various heights from the surface and consequently take out various amounts of thatch etc. As well as removing thatch and dead moss the blades also prune the shoots of the grass plant encouraging stronger growth. Scarifying is much more vigorous and effective than raking or using an electric lawn rake which tend to just take out some of the thatch. Scarifying pulls the dead moss and thatch out of the lawn but in the short term makes the lawn look far worse before it recovers. It is important to schedule scarifying so that it is followed by the appropriate weather conditions that assist the lawn with its recovery. Never scarify without previously applying some moss control 2/3 weeks in advance. If you scarify without applying moss control you are spreading moss spores across your lawn. 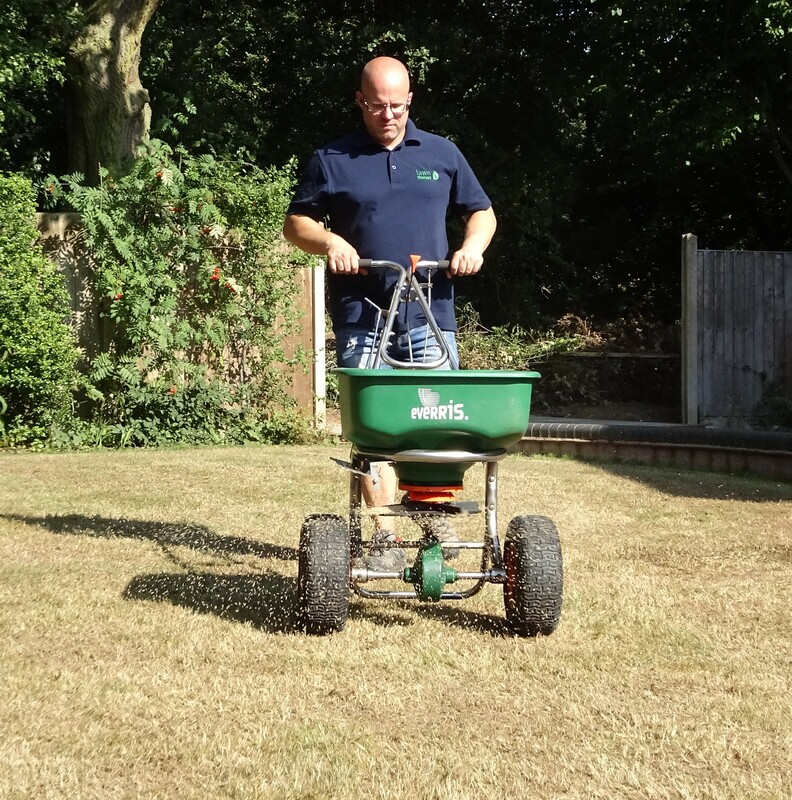 Lawn Therapy can advise you if your lawn requires scarifying but most lawns benefit from scarifying at least every 2 – 3 years depending on soil and weather conditions. Please see the images below for before and after. If you are unsure if your lawn needs scarifying you can contact us to arrange a free survey or book a free lawn survey here. We also offer additional lawn care services which your lawn may benefit from. These include seasonal lawn treatments, aeration, overseeding, top dressing, garden pest control, grass disease control, Lawn Re-Turfing and driveway weed control. 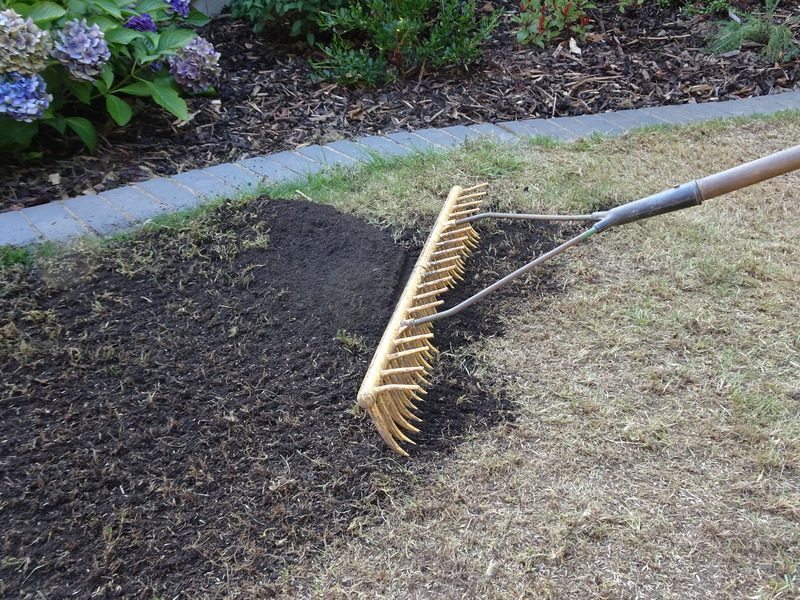 Lawn Aeration is the process of punching small holes in your lawn (lawn spiking) or removing soil cores from your lawn (hollow tine aeration). These processes help improve surface drainage, relieve compaction and encourage a strong healthy root zone. Soil, particularly heavy clay soils have a tendency to compact. The soil particles get pushed closer together by heavy rainfall and heavy traffic on the surface making it difficult for moisture and oxygen essential for grass development to flow freely back and forth from the surface of the soil to the roots leading to poor root development. Poorly developed roots lead to weak grass and poor drought and poor disease tolerance. Compacted ground can have serious consequences for any lawns but can be cured by simply aerating the soil helping air, fertiliser and water reach the roots thus benefiting the grass. Lawn Therapy can easily aerate your lawn and relieve compaction. We have professional aerating machines that move across the lawn surface punching metal spikes 2- 3 inches into the ground making hundreds of small holes in the lawn. The spikes can also be hollow to enable them to pull a soil core out of the ground which helps remove troublesome thatch as well as aerating the ground. Lawns should be regularly aerated to ensure that the grass roots are healthy and can develop. Lawn Therapy recommend that lawns are spiked every 1 – 2 years and hollow tine aerated every 3 – 4 years but this can alter depending on your soil type and the amount of traffic across your lawn. Heavy soils will become compacted and need to be hollow tine aerated to reduce the effects of the compaction in the soil and can be top dressed with a 70% sand loam mix to improve soil ventilation. 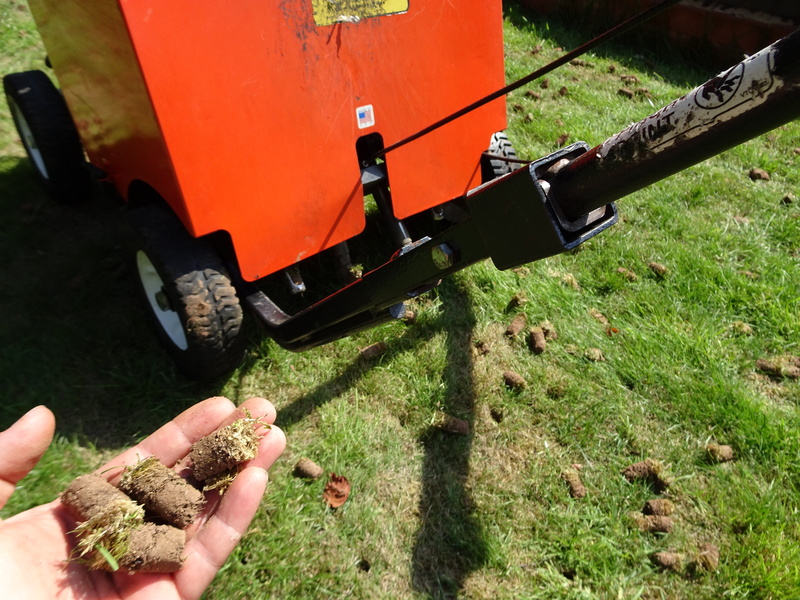 Our Lawn Aeration Service is quick, affordable and highly effective. Call us today and you can also take advantage of our free Lawn Care Survey (or visit our contact us page). Lawn Overseeding is the process of spreading new grass seed over your lawn to thicken up the grass and thus minimise the spaces for weeds and moss to take hold. Grass plants do not live forever they deteriorate and their rate of reproduction slows down. Mature lawns often have areas of weak thin grass which allows moss and weeds to colonise the lawn. The best defence against weeds and moss is thick healthy grass sward. New seed should be regularly introduced into all lawns to replace the ageing plants. If you want your lawn to stay thick and dense then overseeding at least once every 3 years is recommended. Overseeding with a variety of different seed species can be carried out in the late winter or early spring and autumn particularly after you have scarified, aerated or top dressed your lawn. Avoid sowing in extremes of temperature. Seed usually requires a ground temperature above 8c to germinate, shoots need several weeks without frost to survive. Seed requires 3 conditions; good soil contact, warmth and moisture. The spring and autumn are ideal germination times. Hot dry weather is bad as is cold wet weather. Wet and warm are the best conditions for seed germination and grass growth! aerating or spiking of the lawn will also assist seed germination. Lawn Therapy can provide lawn overseeding, lawn aerating and also a top dressing service to help you develop a healthy thick lawn. We select seeds that contain a broad selection of grass species and are in constant contact with our seed suppliers listening to their advice and are currently trialing a new cold start seed that germinates and grows at temperatures of around 5c+ so we can now overseed your lawn even earlier in the year letting you see the benefits earlier in spring. Our lawn overseeding service is quick, affordable, and highly effective. Call us today and you can also take advantage of our free Lawn Care Survey (or visit our contact us page). Top dressing is a vital part of lawn care maintenance and can be a key factor in making critical long term improvements to the health and condition and especially the appearance of any lawn. Top dressing is usually made up with 70% sand 30% loam, the sand will help with drainage whilst the loam retains nutrients. The soil that a lawn depends on plays a major part in the development of the lawn. If you have thin sandy or heavy clay soils they are not ideal for lawns and you may need to consider influencing the nature of your top soil by top dressing. You can significantly improve the quality of your top soil by adding a specific mixture of top dressing to compliment and gradually change the properties of your existing soil. If your lawn has heavy clay soil introducing a layer of fine sandy soil top dressing on the surface will stimulate grass growth, encourage greater rooting, improve surface drainage allowing the soil surface to dry out quicker, thereby reducing the opportunity for moss to develop. Serious drainage problems can be solved by introducing simple land drainage. If you spike or hollow tine aerate your lawn and then top dress, the sandy soil will find its way into the holes improving ventilation and reducing compaction. Prevention is always better than the cure and preventing compaction and limiting damp soil surfaces will certainly make it more difficult for moss to develop. Thick healthy well fed grass also makes it difficult for weeds to develop. Top dressing is labour intensive and sourcing the right quality top dressing can be difficult and expensive when delivery costs are calculated. Approx 5kg of top dressing will cover 1 square metre. Grass seed can be added to the top dressing to thicken up the lawn. Top dressing is compared to varnishing a boat – several layers have to be applied over a period of time. Lawn Therapy can provide its customers with a comprehensive top dressing service which can be incorporated into the lawn care programme at any time. It is most effective in the autumn, early winter, spring and early summer particularly if you want to add grass seed to the mix. Lawn Therapy can make top dressing your lawn a simple exercise. We order, source and spread the top dressing, working the dressing into your lawn using a level lute, drag mat or broom. If you do your own top dressing take care not to cover the grass with too much dressing as this may damage the grass. Most lawn problems are caused by damp soil surfaces and thin grass growth due to poorly fertilised and compacted soil. Combining spiking or hollow tine aeration and top dressing with overseeding is a significant proactive process improving the soil conditions and when combined with other seasonal treatments of fertiliser and herbicide helps to thicken up the grass and pre-empt other lawn problems. Our prices on top dressing are competitive. Call us today and you can also take advantage of our free Lawn Care Survey(or visit our contact us page). 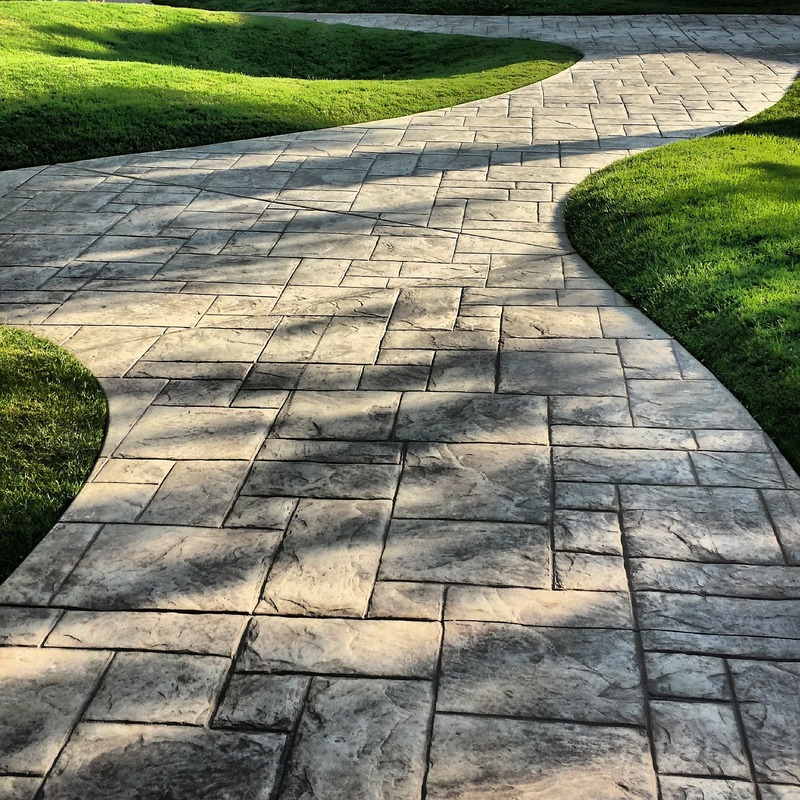 A large percentage of properties these days will have block paving alongside their lawn or garden. With the average family owning more than one vehicle, many families have chosen to remove their front lawn altogether to increase parking spaces. These driveways look superb for the first few years but over a period of time become a haven for moss and weeds. Simply jet washing your driveway to remove weeds and moss will, over a period of time, wash all the sand from between and beneath your block paving weakening the drive This could lead to expensive repairs, jet washing alone will also just spread the spores from the moss around your driveway and onto any grass or other hard landscaping you may have. They will then start to grow and the weeds will only benefit from having a good soaking too! 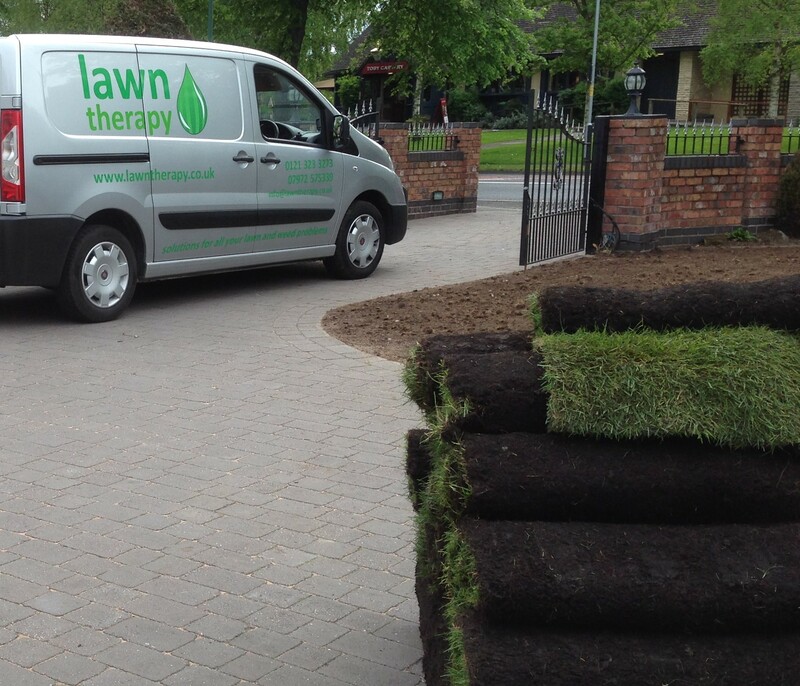 Lawn Therapy offer a driveway and hard landscape weed and moss control service. A herbicide is used to control weeds and grasses whilst a biocide is used to control moulds, fungi and algae. Algae and lichens colonise areas such as drives, paths, slabs, decking and walkways. They are unsightly, damaging and can create dangerous slippery surfaces. The chemical used also has an efficient cleaning action and can visually brighten surfaces. Any dead matter can be simply brushed away from the surface 14-21 days after application. Lawn Therapy are qualified, experienced and have the correct equipment to apply a highly effective safe systemic herbicide to your driveway at a competitive price and it is far more cost effective than you simply buying a domestic off the shelf product and applying this yourself with probable unsatifying results. Our Driveway Weed and Moss Control Service is quick, affordable and highly effective. Call us today and you could also take advantage of our free Lawn Care Survey (or visit our contact us page). There are occasions and conditions when simple lawn renovations would not be suitable – uneven, moss ridden, poor existing soil, newly landscaped gardens or timescales that simple lawn renovations could not achieve. Whatever the reason Lawn Therapy provide a professional lawn laying / returfing service. We use high quality turf from Q-Lawn and nutrient rich free draining root zones to provide the optimum soil conditions for your lawn to become established within weeks of laying. Our Lawn Returfing service would begin by arranging a free lawn survey at a convenient time to assess firstly whether your existing lawn can be renovated and discuss your options, we would take soil samples to assess drainage and determine the existing soil type. If we decide that returfing is the best way forward we will give you a competitive cost effective quote to complete the work. It is worth noting that we will only supply and lay our own turf as we know and trust the quality of the product and have a guarantees from our suppliers. Lawn Therapy’s services are quick, affordable and highly effective. Call us today and you can also take advantage of our free Lawn Care Survey (or visit our contact us page). Lawn Therapy also offer additional lawn care services which your lawn may benefit from. These include seasonal lawn treatments, aeration, overseeding, top dressing, garden pest control, grass disease control, Lawn Re-Turfing and driveway weed control.